I was sitting on my front porch the other day, listening to some music and enjoying my gorgeous yard thanks to Mountain Brook Lawn Care and Maintenance, when the familiar opening twangy guitar chords of Folsom Prison Blues struck through the air. Hearing the late great Johnny Cash sing “I hear the train a-coming” was all it took to get my foot tapping with the beat and my mind wandering. 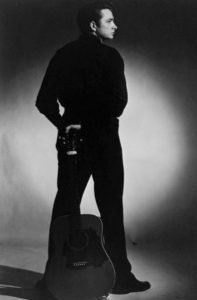 The Man in Black, as he is often referred to, is a music legend that spans all genres of music. To the untrained ear, his guitar playing sounds simple and repetitive, but every musician knows that Mr. Cash’s songs are made up of some of the more difficult chords to play. He was truly a talented guitar player, and had a very unique and recognizable voice. He started every performance by saying, “Hello, I’m Johnny Cash” in his deep voice and to this day, every time I hear one of his songs, I repeat that to myself. He wrote Folsom Prison Blues after watching a movie about the prison. There’s a lyric about shooting a man just to watch him die that always reminds me of how twisted and messed up some people are in this world. Anyway, Mr. Cash actually decided to perform for the prisoners at Folsom Prison and recorded a live version of the song which ended up winning him a Grammy. Who would have ever thought a live recording of a song inside of a prison would win someone awards and fame? From what I can gather about Mr. Cash, he just wanted to give the prisoners something to enjoy. I guess it was karma that he had great things happen to him in return. It’s a shame that Johnny Cash is no longer with us, but his music will definitely live on forever.